A perfect springtime taco is coming to Mercadito in the River North neighborhood as part of Mercadito Hospitality’s national Tacos for Strength campaign. This May, Mercadito will feature a refreshing and light salmon taco by Chef Rick Moonen of rm Seafood and Rx Boiler Room in Las Vegas. Perfect for the increasing temperature, Moonen’s creation is available for dinner and lunch all day for $18.50. A percentage of the proceeds will benefit Share Our Strength. , on Instagram @ChefMoonen or www.rickmoonen.com. Each month, chef and owner Patricio Sandoval invites a different chef to “think outside the tortilla” and create a taco inspired by their culinary or personal passions, which will be served in all Mercadito restaurants with a portion of proceeds going to Share Our Strength. Since its inception, Tacos for Strength has sold more than 5,000 tacos and raised thousands of dollars to benefit Share Our Strength. 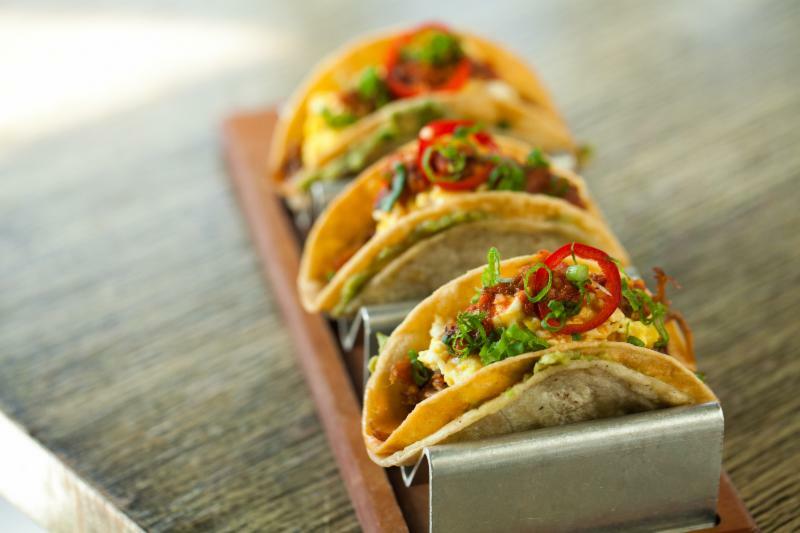 Mercadito offers a variety of special promotions including: Taco Tuesday, 2 tacos for $6.50 every Tuesday, 50 percent off your entire check all day Sunday for industry guests, and Cooking Demos with Chef Patricio monthly. Mercadito is open seven days a week. Dinner and late-night dining begin at 3 p.m. until midnight Sunday, Monday and Tuesday. Wednesday and Thursday beginning at 3 p.m. until 1 a.m. Friday 3 p.m. until 2 a.m. and Saturday 4 p.m. until 3 a.m. Lunch hours are Monday – Friday, 11:30 a.m. – 3 p.m. Mercadito brunch service is 11 a.m. – 3 p.m. Saturday and Sunday. Reservations are recommended through Open Table or by calling 312.329.9555. Mercadito is located at 108 W. Kinzie in Chicago. , like on Facebook (facebook.com/MercaditoChicago) or follow on Twitter (@MercaditoCHI). Mercadito Hospitality has grown from its first New York City restaurant location in 2004 to become a renowned restaurant group. The popularity of the group’s restaurants can be attributed to Partners Alfredo and Felipe Sandoval, innovative culinary interpretations created by Chef/Partners Patricio Sandoval and Guillermo Tellez, and its joint venture with renowned beverage consultants Paul Tanguay and Tad Carducci – the Tippling Bros – who bring inimitable flavor profiles to the group’s beverage programs. JC Whitney today announced that this year’s 10th Annual JC Whitney Car Show will celebrate the company’s centennial with a series of special events. The show will be held at JC Whitney’s corporate headquarters in LaSalle, Illinois on May 3rd. As one of the traditional first events of the LaSalle area car show season, the JC Whitney Car Show has long attracted hundreds of stand-out cars, including a wide array of originals, restorations, street machines and more. Over 500 cars are expected at the show in May and, with over 30 participant-judged car classes including Original/Restored, Street Machines, Street Rods, Motorcycles, Jeeps, Corvettes and more, this year’s show promises to be the best ever. Trophies will be awarded to the top three vehicles in each class, and a six-foot trophy, with a cash prize, will be presented to the vehicle named ‘Best of Show’. The Special Centennial events include the unveiling of the original Warshawsky sign (from the State and Archer building) in its permanent installation at JC Whitney headquarters; an appearance by the JC Whitney Centennial Jeep, and birthday cake to celebrate the Centennial Year. Additional events at the show include product installation demonstrations by Powerstop, Lund/AVS and Rancho, special show discounts by Flowmaster, and more. The event runs from 9 am – 4 pm on Sunday, May 3, and is free for participants and attendees. Tours of the headquarters will also be available for media. For details about show registration and car classifications, please visit the JC Whitney Car Show page, here. The JC Whitney Spring Car Show is just one of many events this year in celebration of JC Whitney’s 100th anniversary. For more information on the JC Whitney Centennial and the Centennial Jeep, go to 100.jcwhitney.com, and be sure to join in on the JCW Centennial celebration by following us on Facebook, Twitter, Google+ and Instagram. Use #JCW100 to stay current with show and Centennial happenings. Sponsors of JC Whitney Centennial include: Bestop, Lund, Flowmaster, Westin, Covercraft, Powerstop, Yukon Gear, Rancho and B&M – equipment. Established in 1915, JC Whitney & Co. is the largest direct marketer of name-brand automotive parts and accessories, providing "everything automotive" with more than 6 million automotive applications from the latest model year back to the 1920s, and over 1.2 million parts for over 25 million different vehicles. Backed by 100 years of hands-on, expert customer service, JC Whitney offers products for virtually any vehicle — automobiles, trucks, jeeps, modern muscle, motorcycles, and more — through its comprehensive family of general and vehicle-specific catalogs and www.jcwhitney.com. The company is dedicated to providing customers the parts they need at the most competitive prices, along with the highest levels of customer service, fast and low cost shipping, and convenient returns. Discount is not valid on previously purchased tickets. Fandango, the nation’s leading digital destination for moviegoers with 36 million unique visitors per month, announced today the May 6 launch of “We Love Movies,” the company’s largest-ever promotional campaign, celebrating the joys of moviegoing. The summer-long program will feature celebrity pro-social events, VIP movie screenings, summer festival sponsorships, social media activations and widespread television advertising. Fandango will also be giving away a year’s worth of free movie tickets, every day throughout the summer as part of a “We Love Movies” sweepstakes. Headlining the campaign is an original video series, “I Love Movies,” airing across Fandango’s digital network, including Fandango Movieclips, the number one movie trailer and content channel on YouTube, and Fandango channels on Hulu, Roku and Samsung’s Milk Video Service. “I Love Movies” features candid interviews with notable cultural influencers outside the film industry including athletes, musicians, television personalities, innovators and others, all sharing meaningful movie memories from films including “The Sound of Music,” “Rocky,” “Finding Nemo,” “The Spy Who Loved Me,” “The Naked Gun,” “Purple Rain,” “National Lampoon’s Christmas Vacation” and many more. The show’s first guests will include NBA All-Star Dwight Howard, Grammy Award winner Reba McEntire, skateboarding icon and X Games gold medalist Tony Hawk, five-time heavyweight champion Evander Holyfield, award-winning TV host Larry King, rock legend Slash, TV personality Shaun Robinson, country music artist Darius Rucker and others throughout the summer. “I Love Movies” will be Fandango’s fifth original video series to launch since the company implemented an aggressive video development and distribution strategy in 2013, offering movie trailers and movie-related content wherever moviegoers are consuming video. It’s also part of the company’s larger goal of delivering a complete moviegoing experience from movie information, trailers and content to showtimes and ticketing to social sharing around movie fandom. This month, the company celebrates the first anniversary of Fandango Movieclips, the result of Fandango’s successful acquisition of the largest movie trailer and content network on YouTube. Since Fandango’s acquisition, Movieclips subscribers have increased by 49%, adding 3.2 million to its network of more than 9.8 million subscribers. Video views are also up 71% year-over-year, with an average of 350 million video views per month. Over the past year, the Fandango Movieclips team has uploaded more than 6,500 movie trailers and original videos to its digital network, including over 200 exclusive trailers. Earlier this year, Fandango launched a new channel on Hulu featuring its slate of original video series, and a movie trailer and video content channel on Samsung’s Milk Video service. Fandango’s acclaimed awards show “Frontrunners” also appeared on television for the first time on “Access Hollywood,” and as part of in-flight entertainment programming on American Airlines. On Tuesday, May 5, 2015, Tokio Pub is celebrating Cinco de Mayo the only way it knows how- with 9½ straight hours of Taco Time! The restaurant will serve $1 tacos ALL DAY from 11:30 a.m. to 9:00 p.m. The all-day fiesta will feature Crispy Chicken, Steak, Nacho Taco, Crying Tiger Shrimp, and Crispy Fish Tacos, plus specialty yuzu and pineapple margaritas for $5 all day long! For more information, please call 847.278.5181. Russell Crowe arrives on red carpet for The Water Diviner in Chicago! Actor/Director Russell Crowe and producer Keith Rodger pose on the red carpet for the Chicago premiere of The Water Diviner. Crowe made his directorial debut for the film. The premiere was at the Showplace Icon Theatre,Chicago,IL. “The Water Diviner” opens April 24, 2015.